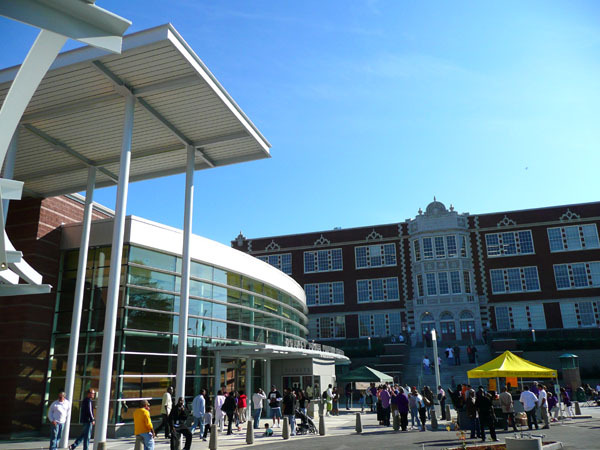 The recently completed $107 million renovation of Garfield High School was the most expensive ever undertaken by the Seattle School District. To put that in perspective, the price tag on the new downtown Four Seasons condo/hotel is $120 million. QWest Field cost $360 million, of which the public covered $300 million. The photo above shows the entrance to the new Quincy Jones Performance Center, and it, along with the rest of the renovation, is, in a word, inspiring. Inspiring because it’s an example of our wealth being spent on something that matters. I have long been astounded by how in one of the wealthiest and most highly educated cities on the planet, we can’t seem to figure out how to a better job with public education. Some argue that we can’t just throw money at it, and of course that is hard to disagree with, as are most shallow generalities. But money doesn’t hurt. As noted in Worldchanging — Alex Steffan’s indispensable compendium of ideas for a sustainable future — according to an international survey Finland has the best public school system in the world. Finland also happens to spend more per grade student than any other nation. No doubt there are other social factors involved, and of them, this is perhaps the most surprising: Finnish students spend less time in class than students in any other industrialized nation. Hello quality versus quantity. 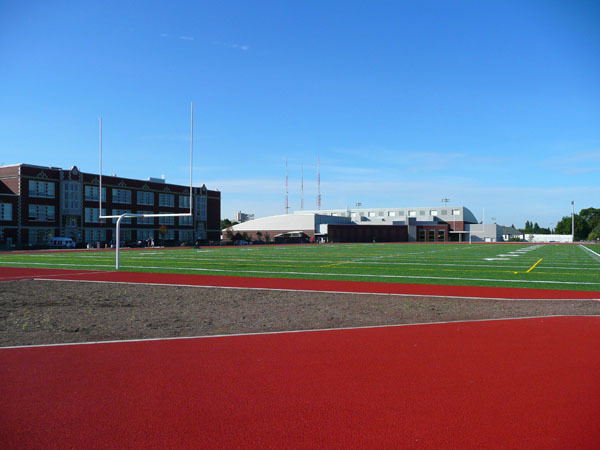 The impressive renovation of Garfield High School won’t eradicate the challenges faced by the school, but it will help. If nothing else it will impart a feeling of pride to the students, and a sense that the community cares about them. It can also be expected to have a positive impact on the surrounding neighborhood (but that’s a long story…). Posted by dan bertolet on	Tuesday, October 7th, 2008 at 9:17 pm. You can follow any responses to this entry through the RSS 2.0 feed. You can leave a response, or trackback from your own site. Is that the school from “Ten Things I Hate About You”? Nevermind. It’s in Tacoma. Many you all have some beautiful schools up there. SPS also did a nice job with Roosevelt High School. I don’t have the figures handy, but these schools were very expensive when they were built, too. At that time (about 1890-1910) the people Seattle made a decision that quality was worth it. You can read about some of it and see some pictures in my wife’s thesis: A “Poor Man’s Friend”? A Study of Seattle Public Schools Alongside the Diary of Helen McMicken, 1880-1900 (large PDF). Another biased but decent book is Good Schools: The Seattle Public School System, 1901-1930 (it’s a little over the top about Frank Cooper, who was great and all but not a savior). I had a foreign exchange student stay with me on Queen Anne a few years ago, and she was placed in the nearest high school. You know the food court at the Seattle Center? Above that there is a low-quality office space that has been converted into a public high school (ok, I use the term “converted” loosely – they’ve changed out furniture). On the way back from signing her up we drove past the old Queen Anne High School, that the city sold for a song a few years back. My point? Garfield, Roosevelt, hold on to what you have tightly. You’re lucky to have it and it’s worth the fight. Garfield sure needed it, it was a real sh**hole (trust me I was there). I only hope that the enthusiasm we’re all sharing here, does not end here. Unfortunately, the district is holding onto what is has tightly- there are kids in the district who still have to wear their coats all morning until the oil heater finally warms up, just like the kids back in 1946 when the portable was first unhitched in the school’s parking lot. No one seems to be asking the obvious question whether the $107 million was wisely spent? Seems like an awful lot of money to me so I’d be curious to know if we bought wisely. The stupidity of “throwing money at education” is much more than “a shallow generality”. It is probably the principle cause of the deterioration of education in the USA. Finland is a tiny (5 million people) country with a relatively high-tech economy. Their education spending statistics include such things as free lunch for all students and free universities. Finland’s success in education isn’t due to big spending. It is the result of old fashioned common sense. In Finland they eschew all the preschool baloney. Kids go to school at age 7 (to learn, not for babysitting service). In Finland parents are expected to be active participants in their children’s education. In Finland you’re not a teacher until you have a master’s degree. In Finland kids stay in the same (neighborhood) school building until they’re 16. If money were the answer, educational results would be improving in the USA, not deteriorating. We’ve been throwing more and more billions at it every year. Speaking of education, my wife is an ESL teacher and has been emphasizing the importance of another election in November: That is, the race for the Superintendent of Public Instruction. Randy Dorn is at the top of the teachers’ lists and should be at the top of yours too. Note that he is the challenger, not the incumbent. Another aspect about the history of education in this country is this constant questioning of actions, all the way back to the 1600s when Puritan leaders were duking it out over how best to keep the “Ole Duluder Satan” out of children’s minds to today with No Child Left Behind. Excellent post. Just found an excellent site with UK government documents on it – http://www.officialdocumentwatch.com is a really well built site and them seem to be very up to date – always posting the latest UK government documents released to the public. Worth a look.